For the purpose of privacy, no last names will be used in this article. The Buffalo Bandettes have been wowing crowds with their sassy and strong dance routines for 17 seasons. 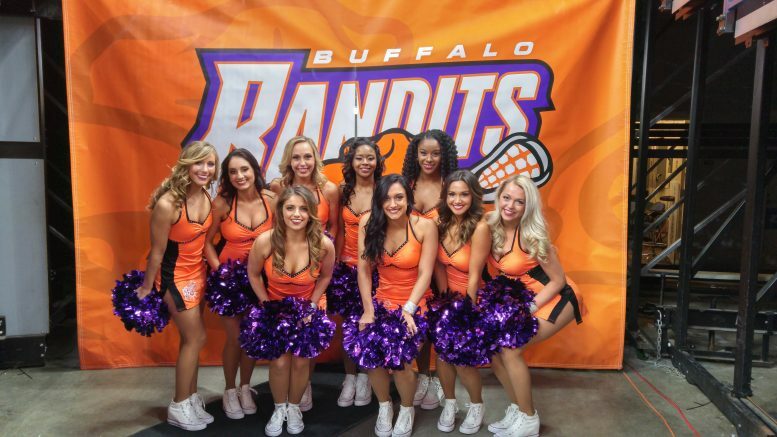 As the premiere dance team in the National Lacrosse League (NLL) and the only professional dance team in Buffalo, NY, the Bandettes perform in “Banditland” at every Buffalo Bandits home game at KeyBank Center, which seats over 19,000 fans! This season marks the second season under the direction of Mandy, who wanted to bring the dancers’ reputation to the next level. Mandy also updated the team’s uniforms this year, such as new dresses, white wedge sneakers and pom poms. This year’s squad of 10 dancers comes together twice a week for two hours each practice to learn and rehearse about a dozen routines. They also come together once a month for team work outs. “It’s very time consuming and a lot of hard work, but we really take pride in what we do,” added fellow dancer-director Jennifer. The Chicago native, who is in her third season with the team, experienced her first Bandits game the first game she performed at. On a typical game day, the Bandettes arrive at the arena about four hours prior to face off. After stretching in their dressing room, the girls take the field and rehearse four routines in one hour of time. Around 6 p.m., the girls go into the arena’s lobby to interact with fans for an hour. Right before the game begins, the dancers hit the turf to perform for the first time. After their routine is over, they catch their breath then return to the field with the Bandits and their opponent for the National Anthems of Canada and the United States of America. 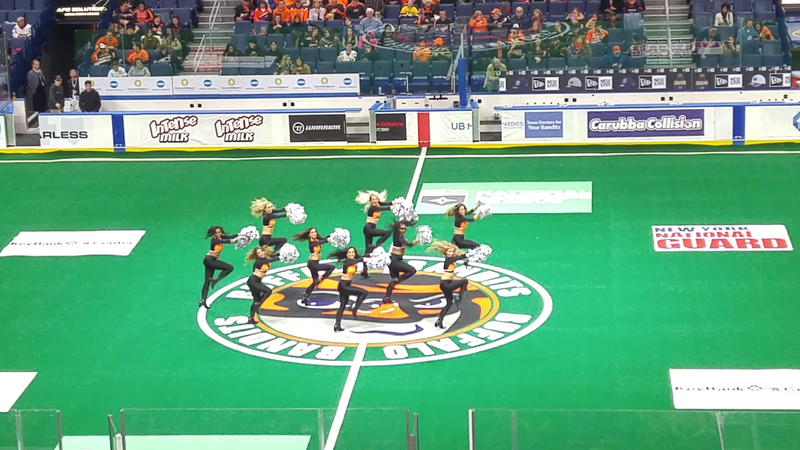 During each of the four quarters, the girls dance “stingers,” two counts of eight of choreography, to music that plays as the Bandits play on the field. They also perform full routines three more times throughout the game, between the first and second quarters, during halftime and between the third and fourth quarters. December 30, 2016 was the home opener of the 2017 Bandits season, and rookie Amanda was excited to take the field for the first time. Outside of performing at Bandits games, the Bandettes enjoy connecting with the community. From ringing bells at the area malls for the Salvation Army at Christmastime to selling raffle tickets at benefits to performing at events like Dancers Give Back to help raise money for cancer research, the team loves to be involved with giving back to the city that gives them so much support. One of the organizations they teamed up with this year is Danceability, an individualized dance, fitness and movement program serving the special needs community. The Bandettes will be joined by dancers from Danceability for a performance at a game in February. “It’s Danceability’s 10-year anniversary so I’m really excited to have them on the field with us,” Mandy said. The Bandettes also look forward to giving girls ages 5-17 the opportunity to be a Bandette for a day with their Junior Bandettes program. This year the juniors will perform a routine with the team at a game in January. If you would like to learn more about the Buffalo Bandettes, check out their fan page on Facebook! Be the first to comment on "2017 marks a new year and new team for the Buffalo Bandettes"